You will need to have administrator privileges to run RawCap. RawCap cannot capture packets from IPv6 interfaces. This also include the localhost IPv6 interface associated with address ::1. Unfortunately the name "localhost" often resolves to ::1 rather than 127.0.0.1, which can cause confusion. Therefore, when trying to capture application traffic on localhost, make sure the monitored application is connecting to "127.0.0.1" rather than "localhost". Sniffing localhost/loopback (127.0.0.1) has some limitations under Windows XP. When sniffing localhost traffic in Windows XP you will only be able to capture UDP and ICMP packets, not TCP. TCP, UDP and ICMP packets can, however, all be sniffed properly from localhost on newer operating systems like Windows Vista and Windows 7. Windows Vista can't capture outgoing packets, only incoming. Select "Program" and press "Next"
Enter the path of RawCap.exe and press "Next"
Press "Next" a couple of times more, then you're done! Firewall rule to allow RawCap to sniff incoming packets. RawCap is freeware and can be used by anyone, i.e. even commercial use is allowed. 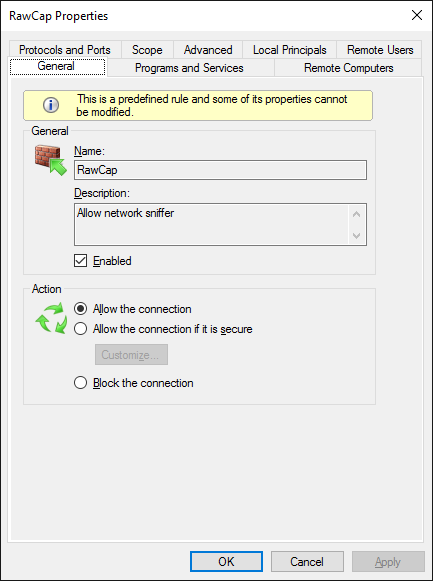 You can read more about RawCap in our blog post "RawCap sniffer for Windows released".